Past and present Guns N’ Roses members are trying to mend fences after comments made earlier this week by original drummer Steven Adler. Early Friday, Adler offered an apology to the entire current GNR crew. "Sometimes my emotions get the best of me when talking about my former band,” explained Adler. “It's hard to see your ex in bed with somebody else. We created one of the biggest-selling debut albums of all time and it's no secret that I want to finish what we started 25 years ago and play together at the Rock And Roll Hall Of Fame. The guys that Axl has put together are all great players. They're not hacks in the sense that they can't play, they're all incredible musicians. I just meant that they are not the original lineup. I would like to apologize to Axl, Bumblefoot, D.J., Tommy, Dizzy, Richard, Frank, and Chris for my statement." 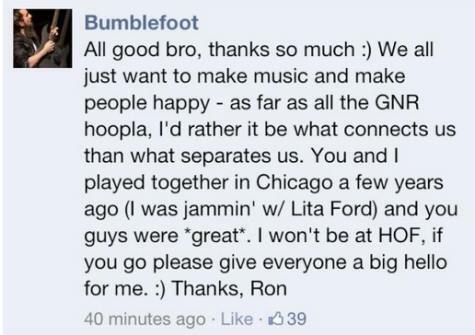 By midday, current guitarist Ron "Bumblefoot" Thal, who joined GNR in early 2006 as the replacement for Buckethead, accepted Adler's apology. "All good, bro. Thanks so much,” posted Thal on his Facebook page. “We all just want to make music and make people happy. As far as all the GN'R hoopla, I'd rather it be what connects us than what separates us. You and I played together in Chicago a few years ago (I was jammin' with Lita Ford) and you guys were great. I won't be at Hall Of Fame. If you go, please give everyone a big hello for me."